For the Girl Who Loves Black & White! My favorite color combo is black and white! It screams elegance, class and sophistication. It doesn’t matter what season it is, for some of us – we would wear this color combo everyday. This post is for the girl that enjoys this color combination! Black is by far my most favorite color to wear. Something about it makes me feel empowered. I fell in love with faux leather dress from Zara. It was only $30 on sale and so comfortable. This dress is so versatile and can be styled in many ways – casual or more of a dressed up look. I decided to pair it with my over the knee boots from Aldo’s Shoes. This look is flattering, chic and effortless. 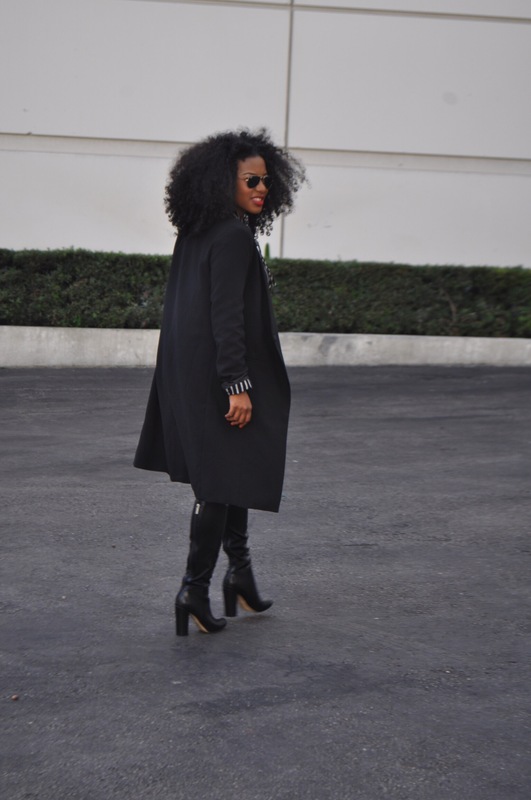 Ladies, you can’t go wrong with an all black look! Over the knee boots! Yes, that’s OTK abbreviated which I recently learned. 😉 During the massive post Thanksgiving sale, I came across these lovely pair of boots from Aldo’s shoes. Ladies, don’t be afraid to pull this look off! I wanted to share a quick review on these babies. Pros: super comfy, heel is not too high (for me), can be worn with multiple outfits and easy to slip on and off. They will definitely keep you warm! Cons: Boots are a bit tight around the calf area but manageable. Overall, these boots were a steal. They are currently on the website at 50% discount. I opted to go with a black boot because it goes with so many things and most certainly makes me look a little bit longer. Here’s the link to take a look at the boots!